PLAINVILLE – St. Martha’s Parish on Oct. 19 celebrated the 60th anniversary of the founding of the parish with a special Mass presided by Cardinal Sean Patrick O’Malley of the Boston Archdiocese. 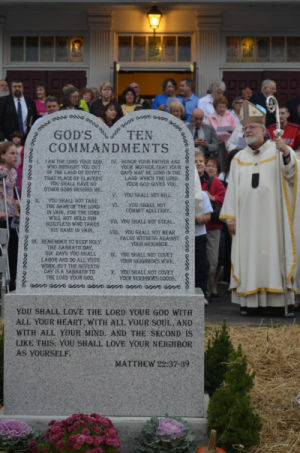 Before the Mass, the Knights of Columbus unveiled a 5-foot-4 inch, 850-pound granite monument of The Ten Commandments that two days prior was installed in front of the church with the help of the Eagle Scouts of Plainville. While unveiling the monument on the 60th anniversary seemed fitting, this event was not the reason for placing the monument. So why did we place this monument? Our late pastor, Father John Walsh, was inspired by a national non-profit organization, Project Moses, to place monuments on the grounds of private organizations for public viewing. The Project Moses mission is to combat a growing secular movement that seeks to take down religious displays on public grounds. Father Walsh also believed the monument would be a positive influence for the parish and its parishioners. When Father Walsh passed away on Oct. 22, 2008, we decided to honor him by setting out to fulfill his vision for the monument. It took nearly five years to complete funding for the project. While he was the original inspiration, the other purpose for the monument is to send a message of how important St. Martha Parish is for our community. While church finances have been a problem for more than five years, that problem has intensified in recent years with pastoral turnover, tragedy, the change from a 10 a.m. Mass to 10:45 a.m., but most importantly a trend away from religion playing a prominent part of our everyday lives. So it is our sincere hope the monument can send a message that not only does the parish need you, but the community needs St. Martha’s to meet their spiritual needs. The message to the Plainville community our council wishes the monument to serve is this. The Ten Commandments on the front of the monument is not meant to be judgmental as no human can live up to these ideals. The base of the front of the monument states in part to love your neighbor as yourself. We don’t think Jesus meant except if your neighbor is divorced, or except if your neighbor is a single mom, except if your neighbor had an abortion, or except if your neighbor is gay. Our new Vatican leader, Pope Francis, recently turned heads with his comments of “Who are we to Judge” people. What a great message we believe in. Yes our faith is pro traditional marriage and family unit and prolife. We make no apologies for that, but who are we to judge others. 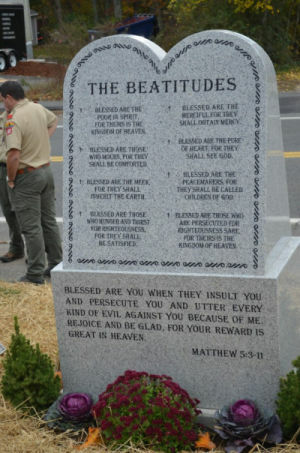 On the back of the monument are the Beatitudes. They all give homage to those who are blessed for some misfortune. So the message of the monument is a message of unity. We want to be a community of faith. Cardinal O’Malley said as much during his homily about the power of prayer. He talked about prayer in private being important to our relationship with God, but prayer as a community helps us to be strong in our commitment to our faith. He also talked about perseverance as being spiritual and committed to faith is difficult at times. Nothing replaces your guidance to show your kids right from wrong, but today it is so hard to keep them true to your teachings. There are just too many influences to distract them from your message. Please help them stay true to you by coming to church more often and leading by example. On a final note, imagine a Plainville where there is no St. Martha’s Parish to celebrate our faith on Christmas and Easter, celebrate a marriage, or mourn the loss of a loved one, yet if that is all we rely on the church for than it simply cannot survive long term. Yes the church needs us, but we need her just as much. May the monument serve to remind us of this and inspire you to share in our community of faith more often. We have great new leaders in Pastor Bill Schmidt and Father Bill Lohan and we hope you can share in their commitment to our parish. Thank you to all who contributed to our monument being placed. There are just too many to honor, but thank you to Father John Walsh who inspired our efforts. He would not want this honor to be exclusively his as so many others before and after him have served this parish with passion. Though we know the monument being placed would put a smile on his face, nothing would make him happier than seeing his beloved St. Martha’s Parish flourish for years to come.